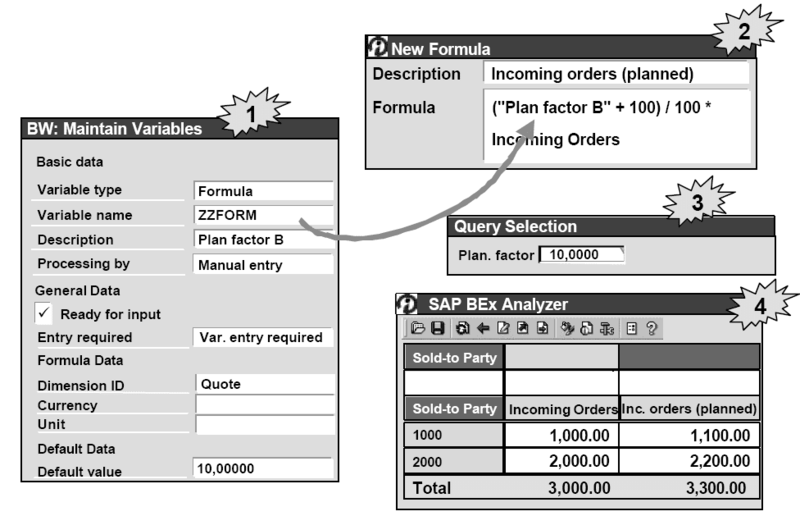 SAP BW Key Figures and Characteristics is the topic we are discussing and here is the continuation for that discussion. Text variables are used if you have not determined texts for the rows and columns, preferring instead to either enter them when you start the query, or generate them from the master data. You can use any available processing type for text variables.You normally use text variables in combination with "variables for characteristic values". If you make use of a characteristic value variable in a row or column when defining a query, we recommend that you enter a text variable for the text. This text variable must relate to the characteristic for which you are using the characteristic value variable and must be processed by means of the replacement path. Use in query definitions: Enter the text variable directly in the text fields, for example for a calculated key figure or a structure. You must enter the text variable with an "&" at the beginning and end, and without blank characters. Example: &0CMONTH&. You normally use variables for formulas when a formula component (a number) should not be set in advance, but should only be entered when the query is executed. 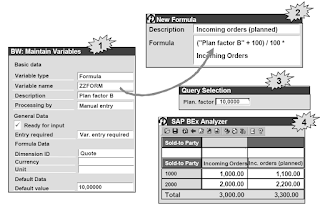 You could, for example, use a formula variable for the rate of value-added tax, so that you do not process the actual current tax rate until you come to insert the query in the workbook You can use any processing type for formula variables. 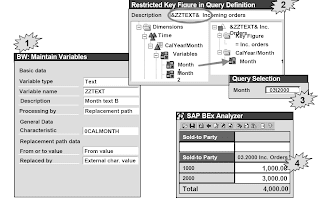 Select the key figures list in the InfoCube tree and choose New Calculated Key Figure from the context menu (right mouse-click). This takes you to the "Calculated Key Figure" screen. Choose an existing formula variable from the operand list and drag it into the input field for the formula, or double -click on it to insert it. Confirm with OK.  When you start the evaluation you can now enter a number of your choice in the dialog box, or accept the default value. If you use a hierarchy node variable, you can select by hierarchy node when you come to use the query. 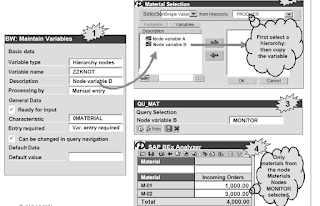 You can process hierarchy node variables using the processing types "Manual Entry/Suggsted Value", "Customer Exit", "SAP Exit" or "Authorization". Select the InfoCube characteristic (from the InfoCube tree) for which you want to apply a variable. Drag the characteristic into the list in the query definition. Select the characteristic and choose Restrict from the context menu (right mouse-click).In the selection menu that appears, enter the hierarchy you want for the characteristic. You can then view the relevant variables on the tab page Variables, where you can drag the variable you want to the selection box, or use the arrow keys to copy it over.A default menu appears when you start the report, where you can select the node you want. 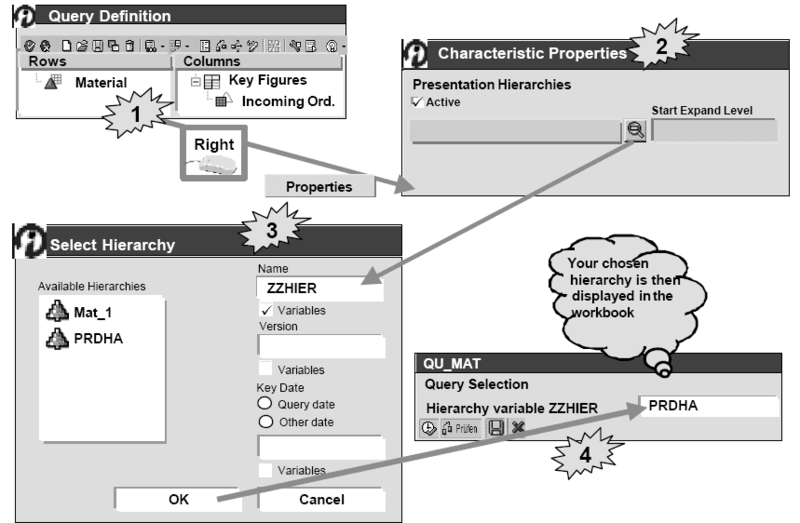 Hierarchy variables allow you to determine presentation hierarchies for characteristics when the report is being created. 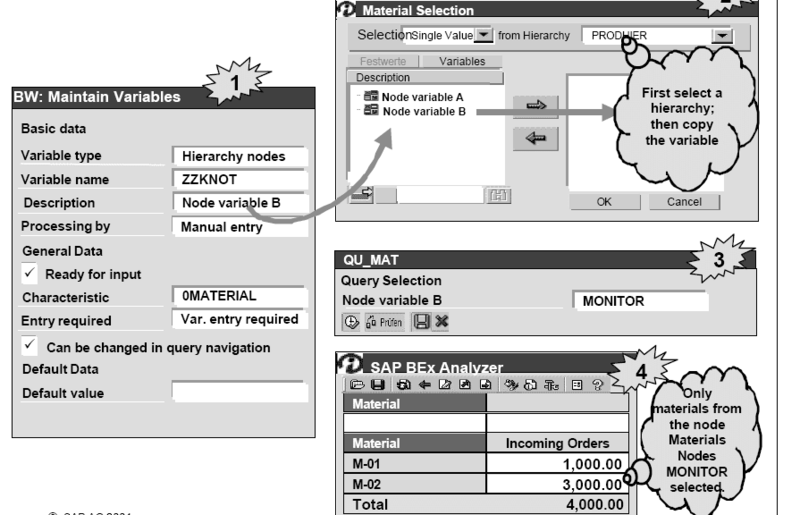 You create hierarchy variables in the variable maintenance of the BW server (transaction RSZV). 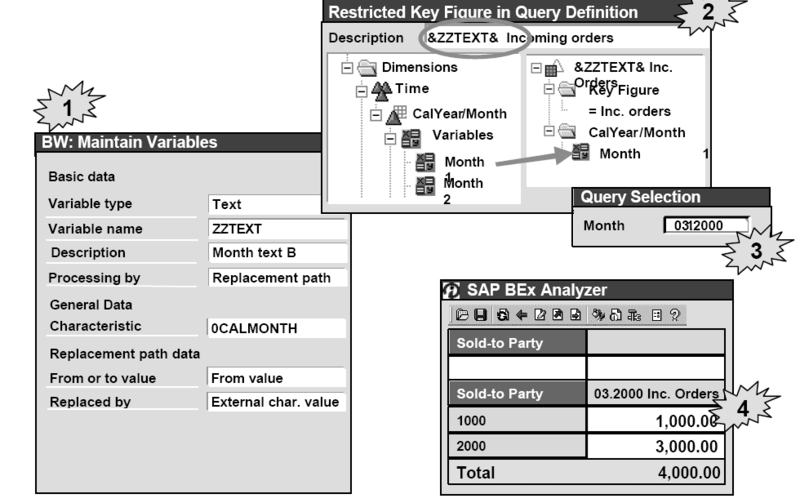 Drag the characteristic you want from the InfoCube tree to the relevant list in the query definition. From the context menu (right mouse click), choose "Properties".Choose the magnifying-glass icon from Presentation Hierarchy. Place a checkmark in the checkbox "Variables" under the field "Name". Then select the hierarchy that you want from the hierarchy variables that now appear in the pull-down menu. 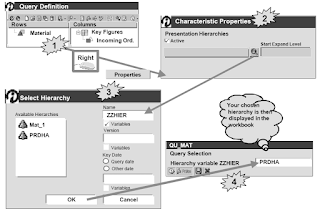 Confirm with OK.When you create a query, you get a dialog box in which you select a presentation hierarchy for the characteristic. The result of the report is then displayed in the form of this hierarchy. Choose New Structure from the context menu (right mouse-click) on the list lines or columns in the query definition. Create a new structure. 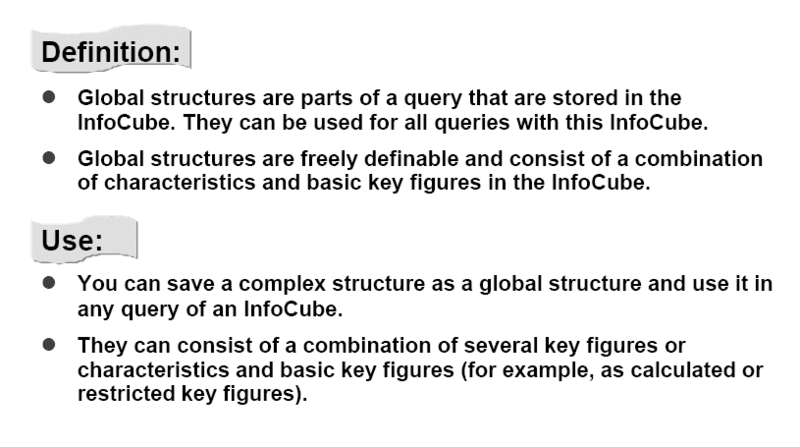 Select the key figures of the InfoCube that you want to use in the new structure, and drag them to the structure list. If necessary, restrict the key figures by means of characteristics. You may have to define a new calculated key figure. Select the new structure. 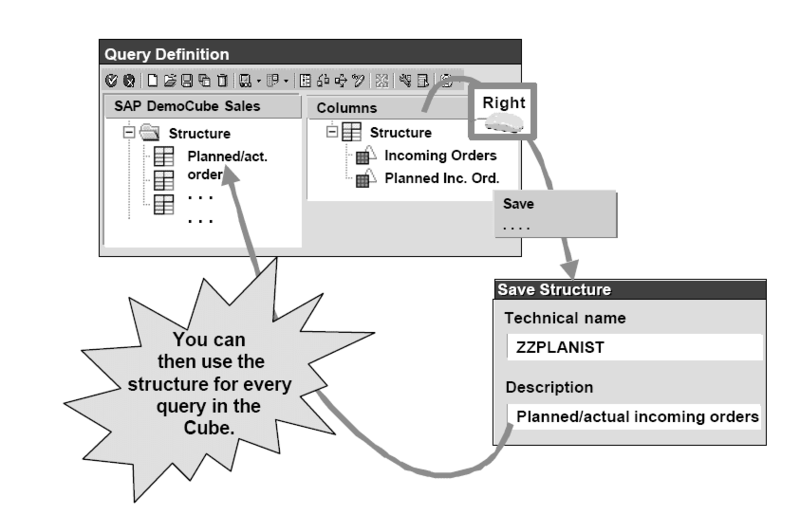 Choose Save or Save as… from the context menu (right mouse-click) and enter a technical name and a description.The global structure is now in the structure list of the InfoCube tree and can be used to create new queries.Changes made later to global structures affect all queries in which they were used. 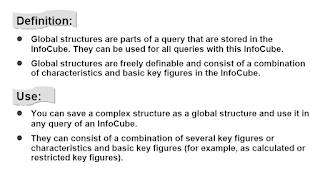 A global structure that is valid for all InfoCube queries can be converted into a local structure, which can only be used for the current query. Changes made later do not affect the definition of the original global structure, nor the queries that you made with this global structure. 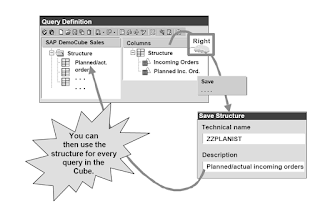 Drag the mouse over the global structure you selected in the query definition, which you want to convert into a local structure. Choose Delete Reference from the context menu (right mouse-click). This copies the global structure to the query definition where you can change it. However, you can only use it for this query.